Professor Dr. Claudia Felser of Johannes Gutenberg University Mainz (JGU) has been awarded a grant by the European Research Council (ERC) worth more than EUR 2.4 million to further her research into new materials based on Heusler compounds. Claudia Felser heads the Materials for Optical, Magnetic and Energy Technologies division at the Institute of Inorganic Chemistry and Analytical Chemistry and is director of the Graduate School of Excellence Materials Science in Mainz (MAINZ). In the near future, she is to become director of the Max Planck Institute for Chemical Physics of Solids in Dresden, while retaining her professorship in Mainz. She has worked for many years in developing pioneering materials exhibiting unique properties and enjoys an outstanding international reputation as an expert in Heusler compounds. The European Research Council is promoting the continuation and development of her research projects by means of an ERC Advanced Grant, which is one of the most highly regarded funding measures of the EU and is only awarded to outstanding researchers. In her application "Designing New Heusler Compounds on an Atomic Scale," Felser submitted an innovative proposal to create intermetallic compounds atom by atom. Using theoretical and experimental methods, the Mainz chemist has so far designed a series of Heusler compounds with defined properties. These have important applications in future technologies, such as thermoelectrics and spintronics. Heusler materials are intermetallic compounds and were discovered by Friedrich Heusler at the beginning of the 20th century. Despite the fact that their individual components are not intrinsically magnetic, when these are brought together in combination they exhibit ferromagnetic properties. Although Heusler materials have long been known, the potential of this group, which consists of more than 1500 compounds, has yet to be properly exploited. With support from the ERC Advanced Grant, Claudia Felser will construct a virtual laboratory for designing new Heusler-type materials, be able to predict precisely-defined properties using computer calculations, and synthesize these materials with the aid of various thin-film techniques. "We start with computer simulations and use the results to create compounds with the desired properties taking into account resource availability. Thin-film techniques allow us to create new compounds atom by atom using the building block concept," explains Professor Claudia Felser. 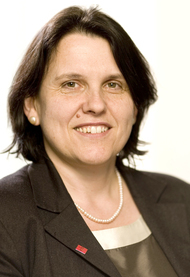 Claudia Felser has been a professor at Johannes Gutenberg University Mainz since 2003. She is the spokesperson for the New Materials with High Spin Polarization Research Unit funded by the German Research Foundation and director of the Graduate School of Materials Science in Mainz. The school was formed with the help of support awarded as part of the German Excellence Initiative in 2007 and is currently competing in the second phase of the competition after submitting a follow-up application. MAINZ consists of work groups from Johannes Gutenberg University Mainz, the Technical University of Kaiserslautern, and the Max Planck Institute for Polymer Research. Claudia Felser has authored over 210 articles for academic journals and received the State Order of Merit of Rhineland-Palatinate for establishing a laboratory for school children at Mainz University. ERC Advanced Grants are awarded to outstanding scientists to conduct projects considered to be highly speculative due their innovative approach, but which, because of this, can open up new paths in the respective research field. The only criteria considered when deciding to award ERC funding are the scientific excellence of the researcher in question and the nature of their research project. An ERC Grant thus represents recognition of the recipient’s individual work. Co-Director of the Graduate School of Excellence "Materials Science in Mainz"